The SWIGG study will test water from hundreds of wells in Grant, Iowa, and Lafayette Counties to determine whether drinking water contamination issues exist, and if so, what is causing the contamination. 44% of residents in Grant, Iowa, and Lafayette Counties obtain their drinking water from private wells. Unfortunately, little is known about the quality of the water citizens are drinking, though some evidence indicates that the water coming from these wells can be contaminated with pollution like bacteria and nitrates. Like other parts of the state that have experienced contaminated drinking water, Southwest Wisconsin has fractured bedrock that can allow pollutants from the surface to easily make their way into groundwater. These pollutants can cause illness in people and animals that drink the water. Wells sampled in Grant, Iowa, and Lafayette Counties test positive for coliform bacteria (Figure 1), an indicator of potential contamination, at a higher rate than many other counties in Wisconsin. 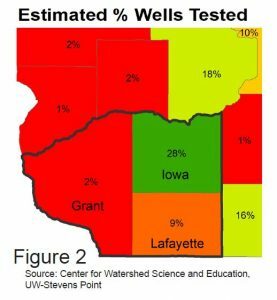 In Grant and Lafayette Counties, though, many wells have not been sampled (Figure 2). The goal of the SWIGG study is to determine the quality of the water in our wells. If contamination exists, the study will give counties and the state better information about how to protect public health and make sure every resident has water that is safe to drink. 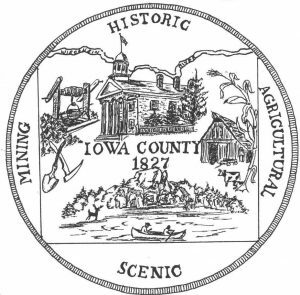 The county land conservation departments from Grant, Iowa, and Lafayette Counties are funding the study and will be collaborating with UW Extension and researchers from the Wisconsin Geological and Natural History Survey, the US Geological Survey, and the US Department of Agriculture. How is the study being done? The first phase of the study will involve a broad sample of hundreds of wells in Grant, Iowa, and Lafayette Counties for nitrates and bacteria to assess whether well water contamination exists and how widespread it is. Next, researchers will look at the geology around sampled wells and how wells are constructed to determine what might be influencing how pollutants get in well water. For wells that are contaminated, researchers will take additional samples to determine the source of that contamination. Participation is voluntary. Randomly selected households will receive a letter by mail asking for their participation. Will my well test information be shared? No. All individual results will be kept confidential. Any information that is shared will be presented in a way that does not identify individual wells or their owners. Participants will be notified of their individual well test results. If I already tested my well, should I participate? Absolutely. This study will be a much more detailed look at potential groundwater contamination and its causes, and the researchers need samples and results specifically for this study. Is there an event where I can learn more? For residents interested in learning more about this important work, public events will be held in some locations. At those events, researchers and county officials will be on hand to discuss water quality issues Southwest Wisconsin faces and the study itself. Check back for dates when public sessions will be available.